Balangkas: Questions directed to listener about his fears. Tells of Jesus who can take away fears; His leaving heaven, coming to earth; dying as atonement. believe, be cleansed, receive new life from Jesus. He can help and protect. Talk to Him and follow and obey. Heaven and happiness assured. Sinner's prayer. Do you have fears? Are you afraid of sickness? Are you afraid of evil spirits? Are you afraid of dying? Are you afraid of the spirits of those who are dead? I have good news for you. I will tell you about Someone Who can take away all your fears. His name is the Lord Jesus Christ. He is the only Son of the true God. He lived in heaven. There everything is full of happiness. But He saw the people of the earth. They were full of sin. This made them sad. They had sickness and fears. Jesus loved them. So He left His home in Heaven and came to this earth to live. Why did He do this? Because He wanted to help people. He was good (holy) but the people were bad. The punishment for their sins was this: After death they would go forever to suffer in the place of fire. 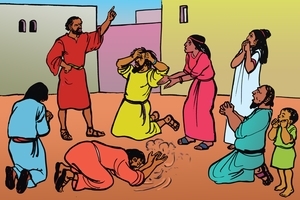 But Jesus did not want them to go to this place, so He bore the punishment for their sins. Jesus died to take away (pay for) their sins. If you do not receive Jesus, you must bear your own punishment. But if you believe on Jesus, He will wash away all your sins and put His life into you. You will be changed. You will not want to do anything bad. You will want to do only what is good in the eyes of God. After Jesus died, He came to life again and went back to Heaven to live with His Father. Now He is alive forever. He has broken the power of death and of Satan. He is stronger than all others. When you believe on Jesus and obey Him, God will be your Father. He will help you when you are sick. He will take care of you if you ask Him to. He will not let evil spirits harm you. You cannot see Jesus now, but He is alive and He can see you. He sees everything. He knows everything. He can hear you when you talk to Him. He wants you to talk to Him often. He is your best friend. If you are afraid, tell it to Jesus. He will take your fears away. If you are sad, Jesus will be with you and comfort you. He will make your heart happy. When you believe in Jesus you must turn away from your bad customs and sins. Tell Him that you will go His way. Then He will forgive your sins and make you happy. He is powerful and will always help you if you follow Him truly. When you die you do not need to be afraid. Jesus will take you away from this earth and will give you a beautiful home in Heaven (His good place). You will be alive there. You will always be happy there. You will never come back to this earth again. You will live with God. Tell Him: "God, I believe in Jesus. I want Him to take away my sins. I want Him to change me. I want to be Your child and You will be my Father in Heaven. I turn away from my sins now. Thank you." When you have done this, Jesus will take all fears from your heart. Then follow Him always. GRN has recorded a version of this script in 669 languages and dialects. See full list.